Replacement complete screen including the LCD display and digitiser for the iPod 5th generation in white, this is an original genuine Apple screen part, this replacement iPod Touch 5 screen is used to repair display problems including dead pixels, cracked LCD, broken digitiser and incorrect colour display issues. 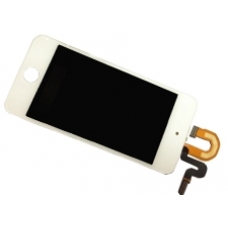 This is a complete iPod Touch 5 display assembly and allows for direct replacement of an existing broken screen, no other parts are required. * Apple Part Numbers: Display: 821-1470, Digitiser: 821-1473.